like many other beekeepers (both experienced and non-) this year, our bees died. they somehow managed to make it through the hardships of winter with plenty of honey and pollen left over, but their population just wasn't enough to keep the colony afloat. it is very sad to look into one's colony to see a tiny number of worker bees valiantly surrounding a dying queen as she does her best to keep laying. it's hard to not take personally. these photos show the last cluster, the leftover honey, and eggs and larvae in various stages of maturity. so, who know what happened. we had questions about this queen during the summer. perhaps our gut instincts about her were justified--perhaps she was not a very good queen. 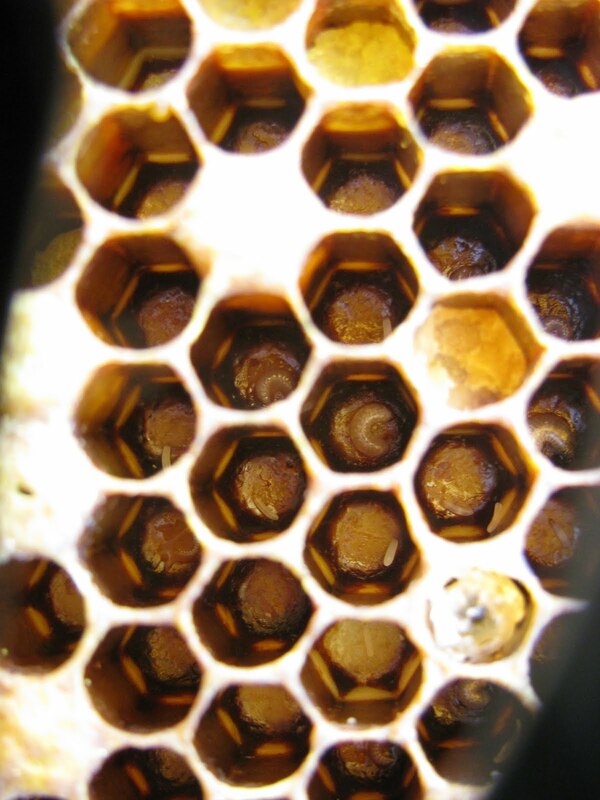 we didn't treat for varroa mites--maybe that was it. maybe dr spivak was right, and all of the university of minnesota's bees overlapping territory provides just too much competition. we don't know, and probably never will. oddly enough, we found out about the status of the colony the day after another bee class with some of the best bee people in the country. so it goes.